I led the MusicWorks group at Philips Interactive Media, where I was a Senior Producer developing titles for the Compact Disc Interactive (CD-i) set-top box multimedia platform. As part of our interest in making music titles, we collaborated with the Compact Disc standards group at Philips (the inventors of the CD along with Sony) to invent the first “hybrid” CD format, which included multimedia content on a standard music CD. This format was called CD-i Ready, because the biographies, discographies, videos, games, etc. were in the CD-i format. We designed and produced titles in the CD-i format on Mozart, Luciano Pavarotti, and James Brown. 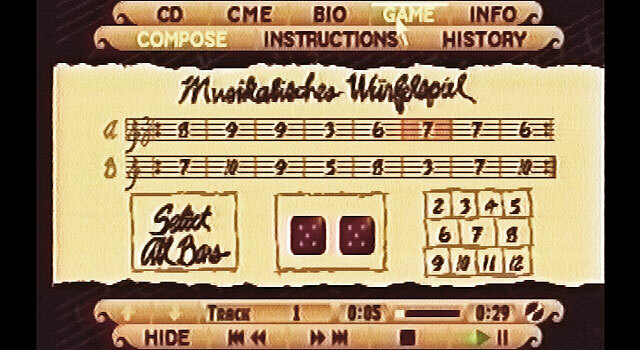 For the Mozart Disc, we created a special game based on Mozart’s “Musikalisches Würfelspiel” (Musical Dice Game), which allowed users to create a 16 bar minuet by rolling a pair of on-screen dice to randomly select a series of musical measure from a set of 272 that Mozart composed.